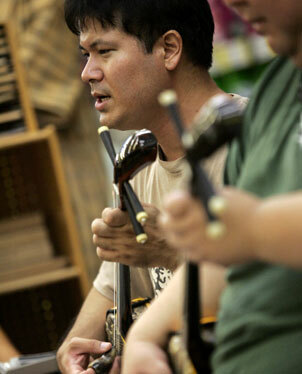 Eric Wada rehearses at Jikoen Hongwanji Temple in Kalihi for the performance of "LooChoo nu Kwa," set for Sunday at Mamiya Theatre. For a production that has already been successfully road-tested, anticipation is high for the Honolulu debut of "LooChoo nu Kwa: Children of LooChoo." Place: Mamiya Theatre, Saint Louis School, 3142 Waialae Ave. Combining Okinawan court dances rarely seen by the public with a contemporary story illuminating the importance of cultural identity and tradition, "Children" has already moved audiences both in its homeland and in Hawaii. The show was performed in Uruma City in June 2007 and here in March at the Maui Arts & Cultural Center. In the Okinawa show, "the dialogue was all in Okinawan and Japanese. 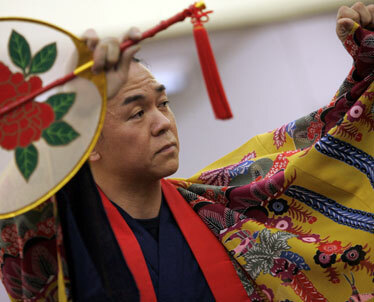 The overall story was about how the country's history, traditions and memories have been either overlooked or lost," said Eric Wada, artistic director of Ukwanshin Kabudan Ryukyu Performing Arts Troupe. "It brought to mind that people need to be reminded not to take for granted the generation that connects pre war life in Okinawa to the present. There has to be a start of dialogue with younger ones in order to preserve the heritage. "From that show, we decided to do a show in Hawaii with a different storyline. We would use the local first-generation history dating back to Okinawa. We also wanted to show a similarity with Hawaii's history, and seeing how the Hawaiian renaissance of around 30 years ago looked to the kupuna as a resource. There's a lot of good when you go back to your roots." Eric Wada goes through his steps. 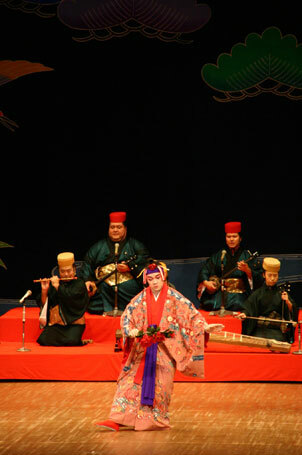 A shot of Wada performing the show in Okinawa. 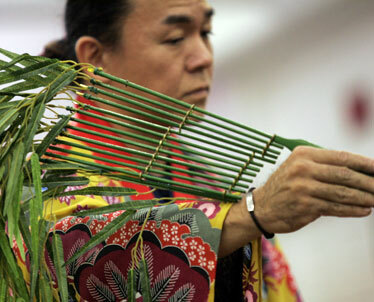 Musician Norman Kaneshiro plays a sanshin. 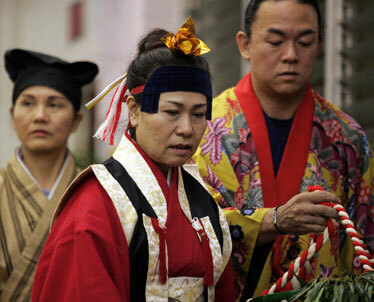 THE SHOW'S title, Wada said, is based on the story of a Hawaii-born grandson's return home for his grandmother's funeral. "He comes back realizing that there's a lot he wanted to ask her when she was still alive, and to find out why his grandma did certain things based on her native Okinawan culture. Her disembodied voice starts talking to him to help him realize that all the music, dances and costumes he heard and saw as a child connects him to being Okinawan, and with her." Wada recalled that the Okinawa show elicited tears from high school and college students, who identified with the grandson. 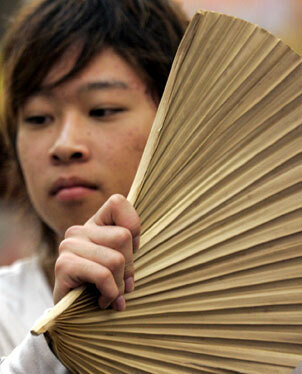 He said his troupe seeks to present a full cultural view of Okinawa. "We tell people it's not all about andagi and fun. We have to look at the whole picture of the Okinawan island culture," one that includes the historical occupations by Japan and the United States. For the Okinawan people, those darker periods are directly tied to their cultural arts. "It's with music and dance that Okinawans have been able to find consolation and refuge," he said. Wada hopes that Sunday's performance will replicate the Maui show, wherein dancers and musicians on stage worked together with the audience to further enrich the story line. "In Okinawa, the dancer is the visible representation of the music, and the audience is the reaction to what's happening on stage, so sometimes there's a verbal dialogue between the two. In Hawaiian, it's called kahea. The shouts and cheers between the dancer and audience (are) very common in Okinawa, but when it happened in Maui, I admit we were really, really surprised." Overall, Wada said, there's one message the audience should take away from the "Children of LooChoo": Our elders are our connection to our culture. "Nurture the old folks, and guaranteed we'll be taken care of." Devin Kawamura, left, rehearses his role of Kaleo, the lead character in the play. Dancers Shizue Afuso, left, Takako Miyazaki and Eric Wada, above, refine their dancing to prepare for Sunday.